...you have most likely found the Devdactic Page because you were looking around the internet for something related to the Ionic Framework because 95% of the content on this page focusses on building awesome mobile apps with Ionic. Oh and btw, that guy to your left is me, Simon! Ionic is a framework to develop cross platform apps for multiple platforms - iOS & Android, but also everywhere else the web runs. This means, you can also build websites, progressive web apps or even desktop apps with Ionic. Once we are finished coding, the HTML app is build into a native app container using Cordova. Or you could simply deploy the folder as it's basically a website. And all of this from one single code base for all platforms! But Simon, I heard Hybrid Apps have a poor performance? Well, times have changed. The web has evolved, devices have evolved and we are not in 2012 anymore! If you want to read the truth about 10 myths around hybrid apps check out my post on this topic! Why Should I learn Ionic? With Ionic, even former web developers can use their existing skills to develop mobile apps. No need to learn Swift and Java and have twice the amount of work. Also, learning Ionic means learning Angular - an awesome framework for web development! Chances are high that if you can't find clients interested in your Ionic skills, you'll find companies looking for talented Angular developers around the web. Faster development time, ease of use and more are additional reasons to get into Ionic, but check these reasons out to convince yourself and your company to start with Ionic! 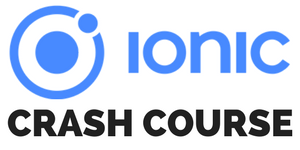 Ok so you are fired up for Ionic and want to take the first steps? Almost all tutorials on this blog start with a basic Ionic template generated with the CLI so everyone can follow all the steps that need to be performed. If you've installed Ionic following the official guides, you can take a look at my beginner tutorials now! I already know Ionic, where to continue? This means you have found this page because you were looking for something specific about Ionic, huh? Hopefully you've found what you were looking for, but there are many more tutorials that go far beyond the beginner level and show you how to integrate different APIs, work with awesome services like Firebase or connect to your own Node.js server! I'm serious and want to learn Ionic FAST! For those of you who don't want to waste time and learn fast, I got something special. After years of working with Ionic I started a dedicated only coding school focused 100% on Ionic! Inside the Ionic Academy you have access to over 30 step-by-step courses, mostly containing video sections. Besides the courses, the Ionic Academy offers projects to apply your knowledge, additional Ionic resources and finally a community of Ionic Developers and Experts in which everyone finds support! If you are serious about learning Ionic, this is the place for you to learn everything Ionic. Never miss any of my posts, get the latest news around Ionic and stay up to date! I am so glad I found your blog other day. You are doing a great job. Simple and easy to understand guides. I found it just before I was going to throw my pc out of the window and leave behind this developer life and go to live in a forest! Your blog posts are awesome and of great relevance to me. Thanks and I appreciate you for coming up with essential posts on IONIC.